I am so excited to add Turkish Towels to our Bungalow Living Store. My family of 5 have been using Turkish Towels for about 5 years now and we love them so much and we are sure you will too! Trust us that these towels will single-handedly revolutionised your summer swimming experience. No exaggeration. You may be skeptical at first but we are confident that you will be a Turkish Towel convert too! The thing about Turkish towels that makes regular ol’ towels the ugly stepsisters in this equation is the amount of space they take up. Or rather, how little space they take up. Due to the lightweight, thin fabric, you can easily fold and roll these puppies into the size of a 600 ml bottle of water. What is there not to love!!?? Turkish towels–sometimes called Peshtemal, Hammam or Fouta towels were originally designed for use in public bath houses. 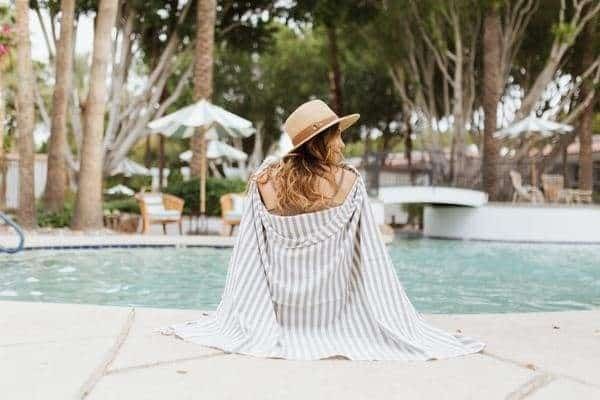 In recent years, they’ve grown in popularity as beach/pool towels, travel towels, and even as gym towels thanks to their large size, high absorbency level, and quick-drying nature. They roll up to virtually nothing, so when heading for a swim they take up less space in your swim bag and also your travel bag and linen cupboard. Unlike other Turkish Towels in the marketplace, our towels are actually made in Turkey from high quality turkish cotton. The tassells that decorate each towel are twisted by hand. Bath Towel – And they can actually wrap around you for optimal post-shower cover-up. Travel Towel – Because they’re big and absorbent and roll up to nothing & weigh very little! I really wish I had one of these when I was backpacking around the world 20 years ago. So much better than than travel towels sold by the outdoor adventure companies! Sarong – A sarong also serves many of these purposes, but the typical sarong lacks the absorbency of Turkish cotton. Blanket OR Throw – For your living room or outdoor space, or when travelling on planes, trains and other situations where you might need a nap. Picnic blanket – lA great size for alfresco dining or impromptu lunch dates in a foreign park are better with a big spread. Tablecloth – Great for beach or park tablecloths for gatherings with family and friends. Tie into a beach bag – No need to pack an extra bag. You can tie a couple of knots and the towel is now a bag. Privacy screen in youth hostels – Hang it from the upper bunk, or create a changing area in a part of the room. Scarf – Yep, you can wear it when you’re chilly. Baby Blanket – Swaddle your little one in a pure organic cotton Turkish Towel. Hi there, how quickly do these dry? Do they dry as quickly as Pack Towls? Worried about using this for backpacking and it not being as quick to dry as the alternative, thanks! Hi there! I did a side-by-side test the other day and the Turkish towel actually dried a little faster than my pack towel! I soaked them both in the sink, wrung them out, and then hung them on a rack in the living room (to get that feel of them being indoors, in a hostel room to dry). I did this mid-day, and they were both dry by the evening, but the Turkish towel made it there faster. Honestly, this is the thing I was most glad I packed, and I nearly didn’t pack it! It ended up being my most useful travel item. I had my backpacker towel that was nice, but I honestly ended up preferring and using my turkish towel twice as much, simply because a) it dried me off quicker/more comfortably, b) was larger (I’m 5’11. This is always an issue for me and towels. ), c) if left in the sun, it was dry in less than an hour, and d) it doubled as a blanket for me. In a lot of hostels, they only gave me a top sheet, and while it may be warm during the day, in many locations, it got pretty cool at night, so I was glad to have something to snuggle under that was breathable, but still warm. I’m still glad I had both – especially my last 6 weeks which I just spent on the beach every day; it was nice to have my turkish towel for beach time and my pack towel for shower time. If I had just stayed in the mountains the whole time, however, I would be happy with just my pretty blue striped towel (just like the one in your photo!). I admit I was skeptical at first about how they would dry me off but I think they actually work better than my microfiber towel. They are definitely more absorbent than a sarong. I’m a fairly light packer and am willing to take the few extra grams this towel may cost me. Tried them out on my last holiday and they are definitely a thumbs up from me. I found them lightweight great for the beach and wrap around you better than towel. We even took one out with us when we went out one evening to put round our legs whilst sitting in an outdoor bar. I love these towels!! I am leaving for Italy next week and already have one in my carry-on pack. I plan to use it for a blanket on the plane, a shawl/scarf when visiting places where I need to cover my shoulders, a picnic blanket in Tuscany, and an actual towel in Assisi when I relax by the pool! I purchased 3 last year to take when we went to Austria for a three week road trip. We were staying in rented apartments, so most places provided linens, but our last place was a hostel with really tiny towels, so these came in handy! They also worked great to put on the floor in the bathroom under our hung up sink washed clothing so we didn’t drip water all over the floor. Love the Turkish towels!